Urban Decay has been teasing us with a Game of Thrones collection since February, and now Winter is nigh. 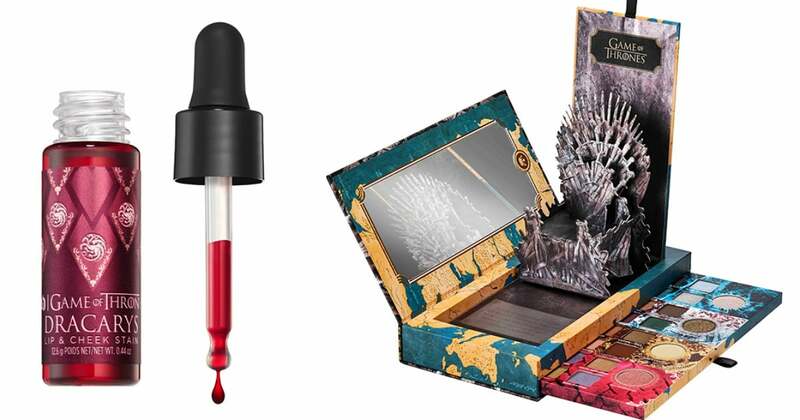 The Urban Decay | Game of Thrones collection first look is here, and by the looks of it, it will easily be the biggest and most anticipated collaboration of the year, and it doesn’t disappoint. To commemorate the eighth and final season of the series, it includes 13 products: a highlighter palette, a 20-pan eye-shadow palette, a lip and cheek stain, two makeup brushes, four limited-edition Vice lipsticks, and four 24/7 Glide-On Eye Pencils, and two fully grown dragons. The Mother of Dragons highlighter palette has three shades with metallic finishes; there are four limited-edition Vice lipsticks: Cersei Lannister, Sansa Stark, Daenerys Targaryen, and White Walker. In addition to four eyeliner pencils, there’s a lip and cheek stain that looks like a vial of blood — which is fitting given the Targaryen sigil on the packaging — and two eye-shadow brushes: one that pays homage to Jon Snow’s sword, Longclaw, and one inspired by Arya Stark’s Needle. The limited-edition products launched worldwide on April 14th on UrbanDecay.com and sold out in seven hours. Don’t be sad, though: the collection will launch on April 29th on Sephora.com and Ulta.com, and in-store May 2nd.